When Mixtard 70/30 came out, it was used to treat Type 1 and 2 Diabetes. Back then, it was called Type 1 and 2 Diabetes Mellitus. Mixtard 70/30 also was used for treating high blood sugar. The generic name for this medicine was Insulin NPH Regular, Pork-Pure. This meant that Mixtard 70’/30 was partially derived from a pork substance. Even though this medicine may have been effective in the beginning, it wasn’t with out its side effects. The ones that most people were affected by were: severe weight gain, constant bouts with low levels of blood sugar and other side effects from the injections. There were other side effects that were just as serious that included retention of water and distributing fat that was out of the ordinary. The water retention itself was noticeable. When using Mixtard 70/30, it was not advisable to take it along with other medications. If you took it with insulin, you could experience excess fluid in your body. This would affect your heart and could have caused additional problems like a heart attack or heart failure. It was advised to consult your physician prior to doing anything of the sort. If you continued to experience side effects and other problems such as swelling, breathing problems or gaining weight quickly, you were advised to consult your physician immediately. Because of the many health issues and other problems Mixtard 70/30 was causing, the drug was eventually discontinued by the (FDA) Federal Drug Administration. In its place came Novolin 70/30. This new insulin drug would be the new savior for diabetes. Now it’s being used to provide additional insulin to your body because your pancreas have failed to produce normal amounts. Insulin is needed to produce energy in your body. If you don’t have enough, that’s where Novolin 70/30 comes in. If Novolin 70/30 is new to you, your physician will advise you on how it should be administered. If you are taking other medications, you must advise him or her of same. That way, they can advise you of how you should administer your insulin. 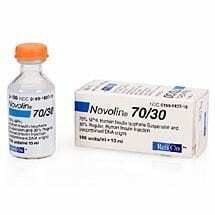 Since Novolin 70/30 is insulin, it should be administered as an injection. Novolin 70/30 works to keep your body going with the additional insulin that you inject in your body. The insulin has to work extra hard to ensure that you have enough energy to get through the day. Because of this, you have to take extra steps so that you won’t get low blood sugar. That is a dangerous thing to have. When taking Novolin 70/30, set aside times when you can snack on food. Don’t forget that you must still eat three balanced meals a day in between. You should also have a blood glucose meter available to check your blood glucose level. If it’s too low, you will want to eat something that has sugar in it. Or you can drink a can of a carbonated drink that has sugar. Even though both will elevate your sugar level, the latter will elevate it quicker. That’s because it doesn’t have to take time and digest like sugary foods would. Another thing you need to do when you’re taking Novolin 70/30 is to exercise. Exercise is the key to keep in shape. This is especially true for diabetics. Novolin 70/30 is a godsend to those who need insulin to stay afloat. The Mixtard 70/30 has become a thing of the past.